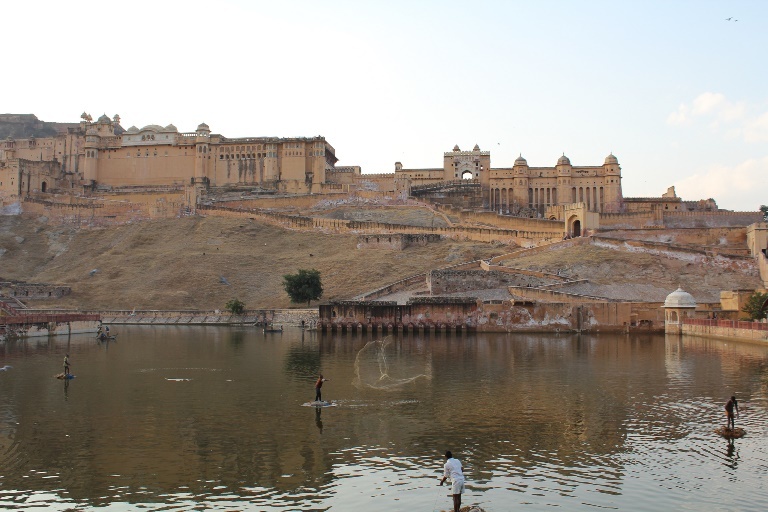 Beautiful and intriguing circuit of Jaipur's historic Old City taking in all the major sights. The following is Liz Cleere's piece on walking here, which was a runner up in our 2011 Travel Writing Competition. Thank you, Liz, for bringing this walk to our attention! The vendor wanted ten rupees (about 12p) for a gloopy crimson drink in a hastily wiped glass. In a nod to hygiene the sidekick wore a grubby cloth tied round his head, but over his sweat stained shirt a grubby woollen vest was streaked with Jackson Pollock stains. After nine hours of almost uninterrupted walking Jamie and I wondered if we were tired and thirsty enough to try the lurid concoction. The day had begun with breakfast on a wide lawn, under the trees of our stately havelli (mansion), Arya Niwas. Blossom floated down into our coffee cups as Jamie checked his camera batteries, and I made some last minute tweaks to the route. 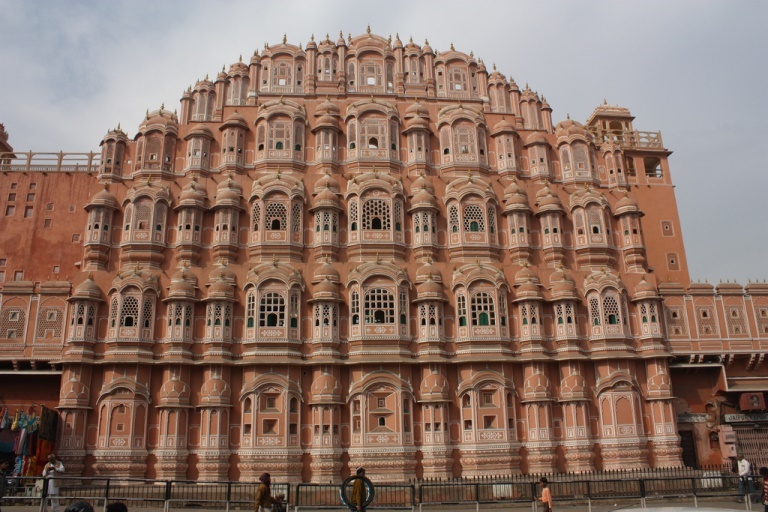 Lying just outside Jaipur's pink crenellated walls our hotel is not far from Chandpol Gate, the perfect place from where to start. The aim was to spend a day slowly walking an eight kilometre circuit of the old city, scooping up all the main sights along the way. But in India plans tend to be set in jelly. After breakfast we strolled out of our hotel onto a side road, and through a group of sleeping cycle rickshaw drivers. One of them sprang into action as we passed, but looked crestfallen when - pointing at our walking boots and rucksacks - we declined his offer of a city tour. He accepted our hollow promises to use his services in the future with a jaundiced eye, and climbed back into his carriage. As we headed up the main drag, tantalising glimpses of the famous pink wall peeped out between the commercial buildings lining the Sansar Chandra Marg. But Jaipur's desert dust and choking traffic fumes soon forced our first detour. Escaping the smog, we ducked into a side alley, and arrived in a medieval world of small commercial workshops. Groups of cows nibbled and sneezed at piles of smelly rubbish, and a stick-thin child pumped water from a standpipe. Like a row of caves, unlit shops - their shelves stuffed with illegible cardboard packets and rusting tins - crowded together along the antediluvian lanes. The quiet detour came to an abrupt end when we emerged from the Middle Ages into a twentieth century traffic maelstrom. 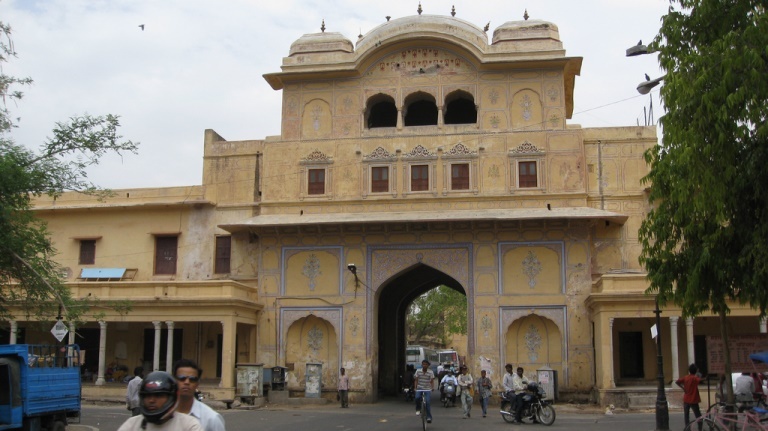 The Chandpol Gateway is one of only eight breaks in Jaipur's twenty foot high, eight feet deep city wall. 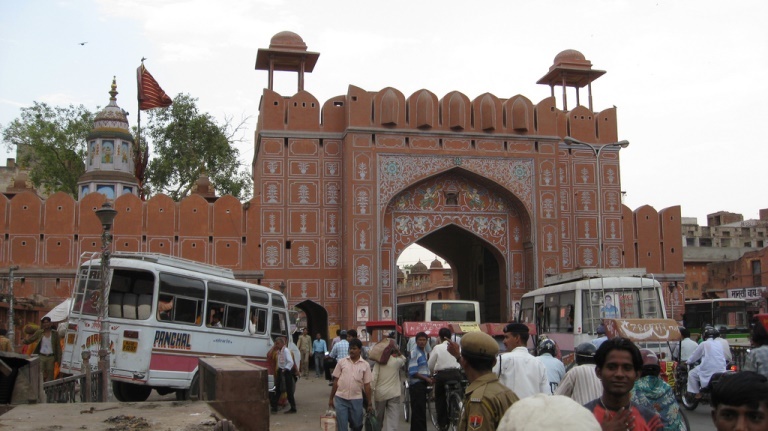 The ornate pink gate comprises a central archway, flanked by two smaller arches, through which a relentless stream of people, animals and vehicles stream: on foot; by bicycle, moped or motorbike; in rickshaws (cycle and motorised); with carts pulled by donkeys (or humans); in delivery vans, taxis or private cars. A full orchestra of sound accompanied the squeezing and pushing:, vehicles hooted and honked their horns, bicycles ding-a-linged and shouted, everyone cleared their nasal and wind passages with gusto, and children cried, laughed or screamed. Waking dogs barked, sleeping dogs played dead, goats ate posters off the walls, donkeys flicked their ears, and the "Kings of the Road" - India's holy cows - nonchalantly chewed the cud in the middle of it all. "Hey, do you want a Jaipur helicopter ride?" shrieked a 14 year old cycle rickshaw driver. He veered into us, cutting off our route. No thanks, we're OK. Looking determinedly ahead we side-stepped his front wheel and got lost in the crowd. On the other side of the city wall, early eighteenth century salmon pink decorative terraces stretched into the distance, along the wide and graceful - but frenetic - Chandpol Bazaar. We took our second detour of the day, and fled the pandemonium down the first passage we saw, the shade and quiet of this unnamed lane allowing us to draw breath in peace. 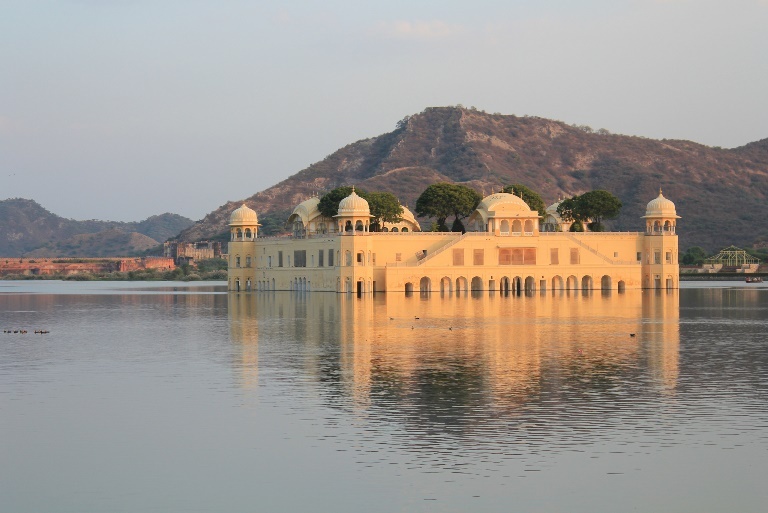 In 1727 Maharajah Sawai Jai Singh II built Jaipur on a grid system, laying out major tree-lined avenues in straight lines from north to south and east to west. Tiny alleys and lanes honeycomb the areas in between. We found ourselves in a less travelled corner, and realising that our walk might be more comfortable if we left the route to chance, I folded the map into my pocket. A few faces looked up as we approached and gave us the usual smile and "where are you from?" greeting. We zigged and zagged our way through narrow alleys lined with tall buildings, wandering roughly in the direction of UNESCO-listed Jantar Mantar. Gazing upwards we saw countless skeletons of brightly coloured kites tangled among the spaghetti of cables and wires, which hold all of India's cities together. Kites weren't the only reason for looking up, entire troops of monkeys live with their human neighbours, mostly on the rooftops, in this densely populated place. They jumped across passages, deftly leaping from ledge to windowsill to rooftop to balustrade, nature's original free runners. The locals laughed at our appreciation of this display of gymnastics, and showed no interest in the everyday occurrence, only breaking off to hurl the odd stone if the monkeys came too close to food. Like most cities in India, each area specialises in one trade, and we lost track of time and place crossing between the invisible barriers. We picked our way through vaults of timber, interspersed with small workshops where men carved miniature Ganeshes-in-boxes out of spicy sandalwood. Next the sound of angle grinders echoed from a hundred tiny ateliers, as stone carvers worked their magic on blocks of marble. Our vision was blurred by stone dust filling the air like the finest white desert sand. Although the artistry was world class, there seemed to be little consideration for safety: we saw no masks, goggles or ear plugs, and many of the carvers worked in flip flops. In another alley we spent an hour with two men working a hand operated printing press, straight from William Caxton's workshop. 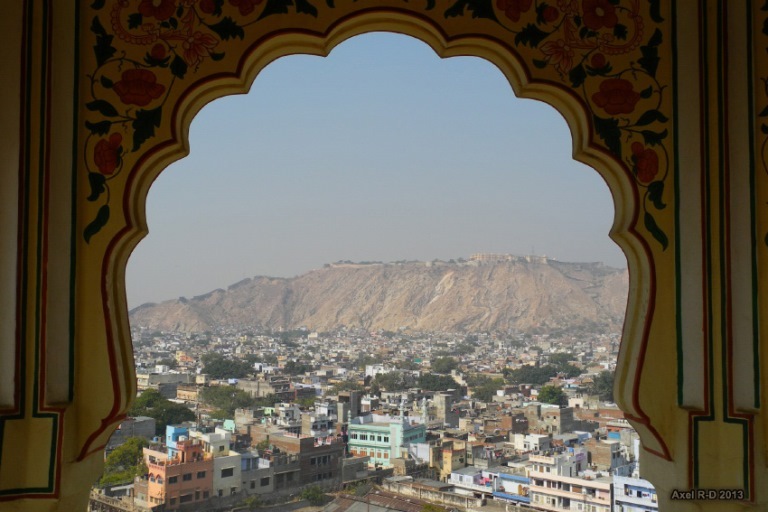 By the afternoon we hadn't seen any of the better known sights of Jaipur, so we took a look round the jazzy city palace, which present day descendants of the old Maharajah still call home. Revived by a Rajput snack in the cool palace courtyard, we relaxed into the crowds on Johari and Bapu Bazaar, where textiles in every colour and print that ever existed were for sale. Declining invitations to step inside the bountiful shops, we preferred to watch elegant Indian women in elaborate saris command attention from suitably deferential assistants. Later, and flagging again, we came across the street vendor and his sidekick. A small crowd jostled for homemade fruit and vegetable smoothies, so we joined the fray and chose the special: beetroot, parsnip, amla (a cross between a large green olive and a gooseberry) and lemon. It tasted of the earth and trees, of air and grass; it was sweet and sour and wholly delicious, the perfect balm for dusty, arid throats. As we drained our glasses we noticed an ancient cycle rickshaw driver waiting patiently next to us. We had set out nine hours earlier, and it would be another two hours to get back to the hotel if we walked straight there. He looked like he could use the fare. "Can you take us to Arya Niwas?"